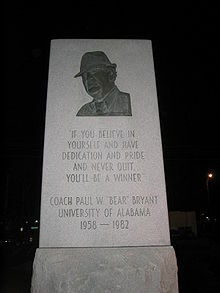 Paul William "Bear" Bryant (September 11, 1913 – January 26, 1983) was an American college football player and coach. He was best known as the head coach of the University of Alabama football team. During his 25-year tenure as Alabama's head coach, he amassed six national championships (tied for the most in modern college football history) and thirteen conference championships. Upon his retirement in 1982, he held the record for most wins as head coach in collegiate football history with 323 wins. The Paul W. Bryant Museum, Paul W. Bryant Hall, Paul W. Bryant Drive, and Bryant–Denny Stadium are all named in his honor at the University of Alabama. He was also known for his trademark black and white houndstooth fedora, deep voice, casually leaning up against the goal post during pre-game warmups, and holding his rolled-up game plan while on the sidelines. Before arriving at Alabama, Bryant was head football coach at the University of Maryland, the University of Kentucky, and Texas A&M University. Paul Bryant was the 11th of 12 children who were born to Wilson Monroe and Ida Kilgore Bryant in Moro Bottom, Cleveland County, Arkansas. :6 His nickname stemmed from his having agreed to wrestle a captive bear during a carnival promotion when he was 13 years old. His mother wanted him to be a minister, but Bryant told her "Coaching is a lot like preaching". He attended Fordyce High School, where 6 ft 1 in (1.85 m) tall Bryant, who as an adult would eventually stand 6 ft 4 in (1.93 m), began playing on the school's football team as an eighth grader. During his senior season, the team, with Bryant playing offensive line and defensive end, won the 1930 Arkansas state football championship. Bryant accepted a scholarship to play for the University of Alabama in 1931. Since he elected to leave high school before completing his diploma, Bryant had to enroll in a Tuscaloosa high school to finish his education during the fall semester while he practiced with the college team. Bryant played end for the Crimson Tide and was a participant on the school's 1934 national championship team. Bryant was the self-described "other end" during his playing years with the team, playing opposite the big star, Don Hutson, who later became a star in the National Football League and a Pro Football Hall of Famer. Bryant himself was second team All-Southeastern Conference in 1934, and was third team all conference in both 1933 and 1935. 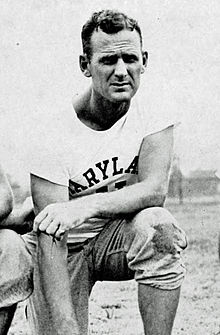 Bryant played with a partially broken leg in a 1935 game against Tennessee. Bryant pledged the Sigma Nu social fraternity, and as a senior, he married Mary Harmon, which he kept a secret since Alabama did not allow active players to be married. Bryant was selected in the fourth round by the Brooklyn Dodgers in the 1936 NFL Draft, but never played professional football. After graduating from the University of Alabama in 1936, Bryant took a coaching job under A. B. Hollingsworth at Union University in Jackson, Tennessee, but he left that position when offered an assistant coaching position under Frank Thomas at the University of Alabama. Over the next four years, the team compiled a 29–5–3 record. In 1940, he left Alabama to become an assistant at Vanderbilt University under Henry Russell Sanders. During their 1940 season, Bryant served as head coach of the Commodores for their 7–7 tie against Kentucky as Sanders was recovering from an appendectomy. After the 1941 season, Bryant was offered the head coaching job at the University of Arkansas. However, Pearl Harbor was bombed soon thereafter, and Bryant declined the position to join the United States Navy. In 1942 he served as an assistant coach with the Georgia Pre-Flight Skycrackers. In 1945, 32-year-old Bryant met Washington Redskins owner George Marshall at a cocktail party hosted by the Chicago Tribune, and mentioned that he had turned down offers to be an assistant coach at Alabama and Georgia Tech because he was intent on becoming a head coach. Marshall put him in contact with Harry Clifton "Curley" Byrd, the president and former football coach of the University of Maryland. After meeting with Byrd the next day, Bryant received the job as head coach of the Maryland Terrapins. In his only season at Maryland, Bryant led the team to a 6–2–1 record. However, Bryant and Byrd came into conflict. In the most prominent incident, while Bryant was on vacation, Byrd reinstated a player who had been suspended by Bryant for a violation of team rules. After the 1945 season, Bryant left Maryland to take over as head coach at the University of Kentucky. Bryant coached at Kentucky for eight seasons. Under Bryant, Kentucky made its first bowl appearance in 1947 and won its first Southeastern Conference title in 1950. The 1950 Kentucky Wildcats football team finished with a school best 11–1 record and concluded the season with a victory over Bud Wilkinson's top-ranked Oklahoma Sooners in the Sugar Bowl. The final AP poll was released before bowl games in that era, so Kentucky ended the regular season ranked #7. But several other contemporaneous polls, as well as the Sagarin Ratings System applied retrospectively, declared Bryant's 1950 Wildcats to be the national champions, but neither the NCAA nor College Football Data Warehouse recognizes this claim. Bryant also led Kentucky to appearances in the Great Lakes Bowl, Orange Bowl, and Cotton Bowl Classic. Kentucky's final AP poll rankings under Bryant included #11 in 1949, #7 in 1950, #15 in 1951, #20 in 1952, and #16 in 1953. The 1950 season was Kentucky's highest rank until it finished #6 in the final 1977 AP Poll. Though he led Kentucky's football program to its greatest achievement, Bryant resigned after the 1953 season because he felt that Adolph Rupp's basketball team would always be the school's primary sport. Years after leaving Lexington, Bryant had a better relationship with Rupp. For instance, Bryant was Alabama's athletic director in 1969 and called Rupp to ask if he had any recommendations for Alabama's new basketball coach. Rupp recommended C. M. Newton, a former backup player at Kentucky in the late 1940s. Newton went on to lead the Crimson Tide to three straight SEC titles. In 1954, Bryant accepted the head coaching job at Texas A&M University. He also served as athletic director while at Texas A&M. The Aggies suffered through a grueling 1–9 season in 1954, which began with the infamous training camp in Junction, Texas. The "survivors" were given the name "Junction Boys". Two years later, Bryant led the 1956 Texas A&M Aggies football team to the Southwest Conference championship with a 34–21 victory over the Texas Longhorns at Austin. The following year, Bryant's star back John David Crow won the Heisman Trophy, and the 1957 Aggies were in title contention until they lost to the #20 Rice Owls in Houston, amid rumors that Alabama would be going after Bryant. Again, as at Kentucky, Bryant attempted to integrate the Texas A&M squad. "We'll be the last football team in the Southwest Conference to integrate", he was told by a Texas A&M official. "Well", Bryant replied, "then that's where we're going to finish in football." At the close of the 1957 season, having compiled an overall 25–14–2 record at Texas A&M, Bryant returned to Tuscaloosa to take the head coaching position, succeeding Jennings B. Whitworth, as well as the athletic director job at Alabama. Bryant took over the Alabama football team in 1958. When asked why he came to Alabama, he replied "Momma called. And when Momma calls, you just have to come runnin'." Bryant's first spring practice back at Alabama was much like what happened at Junction. Some of Bryant's assistants thought it was even more difficult, as dozens of players quit the team. After winning a combined four games in the three years before Bryant's arrival, the Tide went 5–4–1 in Bryant's first season. The next year, in 1959, Alabama beat Auburn and appeared in the inaugural Liberty Bowl, the first the Crimson Tide had beaten Auburn or appears in a bowl game in six years. In 1961, with quarterback Pat Trammell and football greats Lee Roy Jordan and Billy Neighbors, Alabama went 11–0 and defeated Arkansas 10–3 in the Sugar Bowl to claim the national championship. The 1967 Alabama team was billed as another national championship contender with star quarterback Kenny Stabler returning, but the stumbled out of the gate and tied Florida State, 37–37, at Legion Field. Alabama finished the year at 8–2–1, losing 20–16 in the Cotton Bowl Classic to Texas A&M, coached by former Bryant player and assistant coach Gene Stallings. In 1968, Bryant again could not match his previous successes, as the team went 8–3, losing to the Missouri, 35–10, in the Gator Bowl. The 1969 and 1970 teams finished 6–5 and 6–5–1 respectively. After these disappointing efforts, many began to wonder if the 57-year-old Bryant was washed up. He himself began feeling the same way and considered either retiring from coaching or leaving college football for the National Football League (NFL). For years, Bryant was accused of racism for refusing to recruit black players, but he merely said that the prevailing social climate and the overwhelming presence of noted segregationist George Wallace, first as governor and then as a presidential candidate, did not let him do this. He finally was able to convince the administration to allow him to do so after scheduling the Tide's 1970 season opener against a strong USC team led by black fullback Sam Cunningham. Cunningham rushed for 150 yards and three touchdowns in a 42–21 victory against the overmatched Tide. After that season, Bryant was able to recruit Wilbur Jackson as Alabama's first black scholarship player, and junior-college transfer John Mitchell became the first player for Alabama. By 1973, one-third of the team's starters were black, and Mitchell became the Tide's first black coach that season. In 1971, Bryant began engineering a comeback. This included abandoning Alabama's old power offense for the relatively new wishbone formation. Darrell Royal, the Texas football coach whose assistant, Emory Bellard virtually invented the wishbone, taught Bryant its basics, but Bryant developed successful variations of the wishbone that Royal had never used. The change helped make the remainder of the decade a successful one for the Crimson Tide. The 1971 Alabama Crimson Tide football team went undefeated in the regular season and role to a #2 in the AP Poll, but lost to top-ranked Nebraska, 38–6, in the Orange Bowl. Bryant's 1973 squad split national championships with Notre Dame, who defeated Alabama, 24–23, in the Sugar Bowl. The UPI thereafter moved its final poll until after the bowl games. The 1978 Alabama Crimson Tide football team split the national title with USC despite losing to the Trojans in September. Bryant won his sixth and final national title in 1979 after a 24–9 Sugar Bowl victory over Arkansas. Bryant coached at Alabama for 25 years, winning six national titles (1961, 1964, 1965, 1973, 1978, and 1979) and thirteen SEC championships. Bryant's win over in-state rival Auburn, coached by former Bryant assistant Pat Dye on November 28, 1981 was Bryant's 315th as a head coach, which was the most of any head coach at that time. His all-time record as a coach was 323–85–17. Bryant was a heavy smoker and drinker, and his health began to decline in the late 1970s. He collapsed of a cardiac episode in 1977 and decided to enter alcohol rehab, but after a few months of sobriety, he resumed drinking. Bryant experienced a mild stroke in 1980 that weakened the left side of his body and another cardiac episode in 1981 and was taking a battery of medications in his final years. Shortly before his death, Bryant met with evangelist Robert Schuller on a plane flight and the two talked extensively about religion, which apparently made an impression on the coach, who felt considerable guilt over his mistreatment of the Junction Boys and hiding his smoking and drinking habits from his mother. After a sixth-place SEC finish in the 1982 season that included losses to LSU and Tennessee each for the first time since 1970, Bryant, who had turned 69 that September, decided to retire, stating, "This is my school, my alma mater. I love it and I love my players. But in my opinion, they deserved better coaching than they have been getting from me this year." His last regular season game was a 23–22 loss to Auburn and his last postseason game was a 21–15 victory in the Liberty Bowl in Memphis, Tennessee, over the University of Illinois. After the game, Bryant was asked what he planned to do now that he was retired. He replied "Probably croak in a week." Four weeks after making that comment, and just one day after passing a routine medical checkup, on January 25, 1983, Bryant checked into Druid City Hospital in Tuscaloosa after experiencing chest pain. A day later, when being prepared for an electrocardiogram, he died after suffering a massive heart attack. His personal physician, Dr. William Hill, said that he was amazed that Bryant had been able to coach Alabama to two national championships in the last five years of his life with the state of his health. First news of Bryant's death came from Bert Bank (WTBC Radio Tuscaloosa) and on the NBC Radio Network (anchored by Stan Martyn and reported by Stewart Stogel). On his hand at the time of his death was the only piece of jewelry he ever wore, a gold ring inscribed "Junction Boys". He is interred at Birmingham's Elmwood Cemetery. A month after his death, Bryant was posthumously awarded the Presidential Medal of Freedom, the nation's highest civilian award, by President Ronald Reagan. A moment of silence was held beforeSuper Bowl XVII, played four days after Bryant's death. In 1962, Bryant filed a libel suit against The Saturday Evening Post for printing an article by Furman Bisher ("College Football Is Going Berserk") that charged him with encouraging his players to engage in brutality in a 1961 game against the Georgia Tech Yellow Jackets. Six months later, the magazine published "The Story of a College Football Fix" that charged Bryant and Georgia Bulldogs athletic director and ex-coach Wally Butts with conspiring to fix their 1962 game together in Alabama's favor. Butts also sued Curtis Publishing Co. for libel. The case was decided in Butts' favor in the US District Court of Northern Georgia in August 1963, but Curtis Publishing appealed to the Supreme Court. As a result of Curtis Publishing Co. v. Butts 388 U.S. 130 (1967), Curtis Publishing was ordered to pay $360,000 in damages to Butts. The case is considered a landmark case because it expanded the definition of who can be considered a "public figure" in libel cases. Bryant reached a separate out-of-court settlement on both of his cases for $300,000 against Curtis Publishing in January 1964. Three-time National Coach of the Year in 1961, 1971, and 1973.:517 The national coach of the year award was subsequently named the Paul "Bear" Bryant Award in his honor. In 1975, University of Alabama's Denny Stadium was renamed Bryant–Denny Stadium in his honor. Bryant is thus one of the few men to have coached in a stadium named after him. The others are Shug Jordan at Auburn and Bill Snyder at Kansas State and LaVell Edwards at BYU. In February 1983, Bryant was posthumously awarded the Presidential Medal of Freedom by President Ronald Reagan. Charles Ghigna wrote a poem that appeared in the Birmingham-Post Herald in 1983 as a tribute to Bryant. Super Bowl XVII was dedicated to Bryant. A moment of silence was held in his memory during the pregame ceremonies. Some of his former Alabama players were on the rosters of both teams, including Miami Dolphins nose tackle Bob Baumhower and running back Tony Nathan. Also, at the end of Leslie Easterbrook's performance of the National Anthem, several planes from Maxwell Air Force Base in Alabama did the traditional missing-man formation over the Rose Bowl in his memory. Many of Bryant's former players and assistant coaches went on to become head coaches at the collegiate level and in the National Football League. Danny Ford (Clemson, 1981), Howard Schnellenberger (Miami of Florida, 1983), and Gene Stallings (Alabama, 1992) all won national championships as head coaches for NCAA programs while Joey Jones, Mike Riley, and David Cutcliffe are active head coaches in the NCAA. Charles McClendon, Jerry Claiborne, Sylvester Croom, Jim Owens, Jackie Sherrill, Bill Battle, and Pat Dye were also notable NCAA head coaches. Croom was the SEC's first African-American head coach at Mississippi State from 2004 through 2008. NFL head coach Bruce Arians was a running backs coach under Bryant in 1981–82. Ozzie Newsome is active as the general manager of the Baltimore Ravens. He was a Professional Football Hall of Fame tight end for the Cleveland Browns for 13 seasons (1978–90) and stayed loyal to owner Art Modell after the move to Baltimore. Newsome was the GM of the Ravens' Super Bowl XXXV championship team in 2000, and their Super Bowl XLVII championship team in 2012. Jack Pardee, one of the Junction Boys, played linebacker in the NFL for 16 seasons with the Los Angeles Rams and Washington Redskins, was a college head coach at the University of Houston, and was an NFL head coach with Chicago, Washington, and Houston. Bryant was portrayed by Gary Busey in the 1984 film The Bear, by Sonny Shroyer in the 1994 film Forrest Gump, Tom Berenger in the 2002 film The Junction Boys, and Jon Voight in the 2015 film Woodlawn. In a 1980 interview with Time magazine, Bryant admitted that he had been too hard on the Junction Boys and "If I were one of their players, I probably would have quit too." In his 38 seasons as a head coach, Bryant had 37 winning seasons and participated in a total of 29 postseason bowl games, including 24 consecutively at Alabama. He won 15 bowl games, including eight Sugar Bowls. Bryant still holds the records as the youngest college football head coach to win 300 games and compile 30 winning seasons. ^ a b c d Barra, Allen (2005). The Last Coach: The Life of Paul "Bear" Bryant. W.W. Norton & Company. ^ a b c d e "Bear Bryant 'simply the best there ever was'". ESPN.go.com. March 21, 2007. ^ Dunnavant, Keith (2005). Coach: The Life of Paul "Bear" Bryant. Macmillan. p. 53. ISBN 978-0-3123-4876-2. ^ "Bowl bid for Tide hinges on Pre-Flight tilt result". The Tuscaloosa News. November 27, 1942. p. 7. Retrieved January 22, 2012. ^ "USS Uruguay (built 1928; passenger liner) survey report", HDC1668 (SAFR 23827), San Francisco Maritime National Historical Park, reproduced by California Digital Library, University of California. Retrieved May 20, 2013. ^ Tomberlin, Jason (October 21, 2009). "Bear Bryant in Chapel Hill". North Carolina Miscellany. UNC University Libraries. Retrieved January 15, 2012. ^ Browning, Al. I Remember Paul "Bear" Bryant. Cumberland House Publishing. pp. 100–101. ISBN 1-58182-159-X. ^ Phillips, B. J. (September 29, 1980). "Football's Supercoach". Time. Retrieved April 2, 2016. ^ "Recognized National Championships by Year". cfbdatawarehouse.com. ^ "ESPN Classic - Bear Bryant 'simply the best there ever was'". www.espn.com. ^ Barra, Allen (Winter 2006). "Bear Bryant's Biggest Score". American Legacy: 58–64. Archived from the original on May 19, 2010. ^ "Bear's '58 team reunites, recalls Tide's turning point to success". ^ Barra, Allen. The Last Coach: A Life of Paul "Bear" Bryant. ^ Doyle, Andrew (March 1996). "Bear Bryant: Symbol for an Embattled South". Colby Quarterly. 32 (1): 80, 83. Retrieved March 31, 2017. ^ Durso, Joseph (January 27, 1983). "Bear Bryant Is Dead at 69; Won a Record 323 Games". The New York Times. Retrieved March 16, 2015. ^ Harwell, Hoyt (June 6, 1983). "Bryant and blacks: Both had to wait". The Huntsville Times. Huntsville, Alabama. Archived from the original on February 13, 2015. Retrieved March 16, 2015. ^ Barra, Allen (November 15, 2013). "The Integration of College Football Didn't Happen in One Game". The Atlantic. Retrieved March 16, 2015. ^ Puma, Mike. "Bear Bryant 'simply the best there ever was'". SportsCentury. ESPN. Retrieved March 16, 2015. ^ Callahan, Tom (February 7, 1983). "Tears Fall on Alabama". Time (subscription required). Retrieved July 23, 2012. ^ Bear Bryant: 25 Years techography.com. Retrieved on October 17, 2008. ^ "ESPN Classic – Goal-line stand propels Bryant's Tide to title". go.com. ^ Reagan, Ronald (February 23, 1983). "Remarks at the Presentation Ceremony for the Presidential Medal of Freedom". Retrieved July 23, 2012. ^ Bisher, Furman (October 20, 1962). "College Football is Going Berserk" (PDF). The Saturday Evening Post. Retrieved May 27, 2013. ^ Graham, Frank Jr. (March 23, 1963). "The Story of a College Football Fix" (PDF). The Saturday Evening Post. Retrieved May 27, 2013. ^ "Paul Bryant Facts". yourdictionary.com. Retrieved May 27, 2013. ^ Maisel, Ivan (August 16, 1999). "SI's NCAA Football All-Century Team". Sports Illustrated. ISSN 0038-822X. Retrieved November 15, 2007. ^ "al.com: Alabama Football". al.com. Archived from the original on September 27, 2007. Keith Dunnavant, Coach: The Life of Paul "Bear" Bryant (New York: St. Martin's Griffin, 2005). Paul W. Bryant with John Underwood, Bear: The Hard Life and Good Times of Alabama's Coach Bryant (Boston: Little, Brown and Company, 1974). Mickey Herskowitz, The Legend of Bear Bryant, (Austin, Texas: Eakin Press, 1993). Jim Dent, The Junction Boys: How Ten Days in Hell with Bear Bryant Forged a Championship Team (New York: St. Martin's Press, 1999). Tom Stoddard, Turnaround: Bear Bryant's First Year at Alabama (Montgomery, Alabama: Black Belt Press, 2000). Randy Roberts and Ed Krzemienski, Rising Tide: Bear Bryant, Joe Namath, and Dixie's Last Quarter (New York: Twelve, Hachette Book Group, 2013). James Kirby, Fumble: Bear Bryant, Wally Butts, and the Great College Football Scandal (New York: Harcourt, Brace, Jovanavich, 1986). Albert Figone, Cheating the Spread: Gamblers, Point Shavers and Game Fixers in College Football and Basketball (University of Illinois Press, 2012). Furman Bisher, "College Football is Going Berserk: A Game Ruled by Brute Force Needs a Housecleaning", Saturday Evening Post, October 20, 1962. Frank Graham, Jr. "The Story of a College Football Fix", Saturday Evening Post, March 23, 1963. John David Briley. 2006. Career in Crisis : Paul "Bear" Bryant And the 1971 Season of Change. Macon, GA: Mercer University Press.